These Pumpkin Truffles are no different. I’m pretty sure you could blend Oreos with dishwashing soap and it would still taste like heaven. But it is pumpkin season, so I thought “hmm, how can I get as much pumpkin into my diet as possible” – and this was the answer. 2) Place Oreo cookies in a large Ziploc bag and crush lightly. 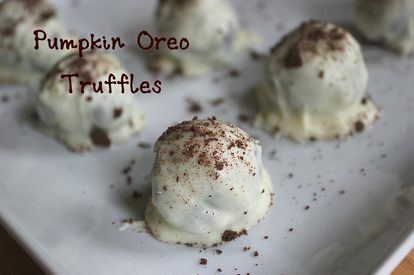 Then place Oreos and pumpkin cream cheese in a food processor or standing mixer and combine until a dough-like ball forms. 5) Temper or, in a double boiler, melt your chocolate. So here’s an easy, poppable dessert for your next fall gathering.